Serves 2 with 4 sausages, with lentils left over for another day. This will serve 4 if you cook 8 sausages. In a large saucepan, heat the oil. Add the onion, carrots, fennel, and a pinch of salt, and fry gently for about 10-15 mins. Stir occasionally. Don't let the veg burn - you want it to cook gently and become soft and translucent. Add the bay leaves and lentils and stir. Add the water, bring to a boil, and then simmer for about 20 mins. You want the lentils to be soft enough to eat whilst still retaining some bite, and for there not to be too much water left. If you need to add more water to stop the dish drying out, do so gradually. 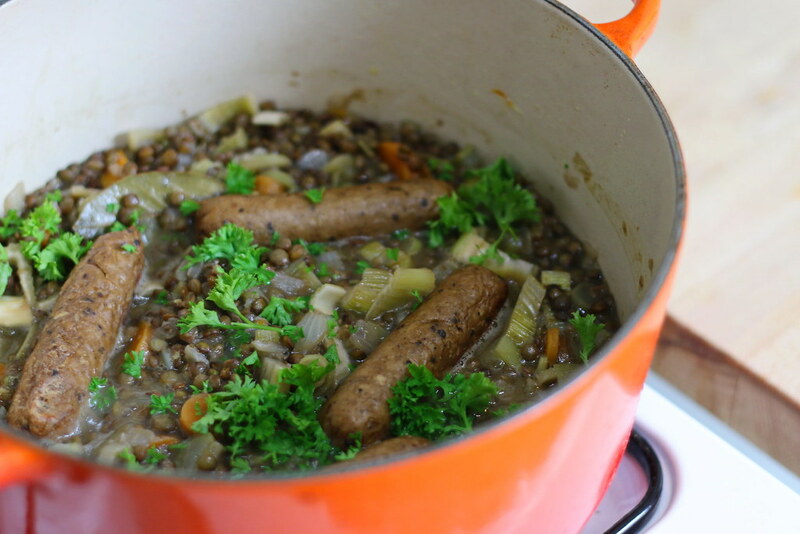 When the lentils are nearly ready, adjust the seasoning to taste and add the sausages. Garnish with parsley and serve immediately. Any leftover lentils will go very nicely in salads. They're also very tasty when topped with a poached egg.